You can learn to ice climb in a day, you can spend years mastering the sport. Gain the skills and knowledge that give you the confidence to be your best at this engaging sport. We teach professional level, current knowledge. Accelerated learning due to: small groups, expert instruction and individual coaching. Comprehensive and thorough coverage of program content, tailored to your pace. 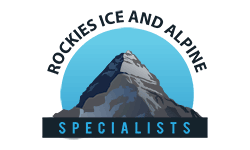 We offer instruction for absolute beginners to start with a solid foundation, as well as for expert climbers looking at advanced clinics or to update their knowledge base. We keep our instructor to participant ratio’s low to increase the value of your experience. Although it would be more profitable for us to fill larger courses, we know a superior program has fewer participants. When comparing prices with other guiding services, keep in mind the group size GREATLY impacts the amount of time you spend climbing, and the level of focused personalized coaching you receive. Remember, the price of one day at a 2:1 ratio is worth three days spent out at 6:1 ratios! No prior ice climbing experience required. Looking for a taste of climbing and picking up the basics? Try our ‘Ice is Nice’ intro day! On this technique orientated program you will develop an efficient and controlled climbing style on steep and funky ice. This is fun and physical climbing on some steep ice formations. 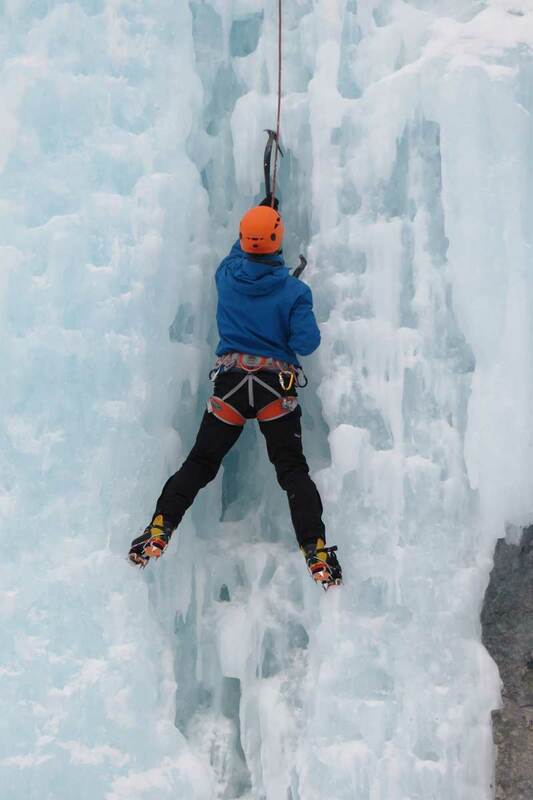 Prior ice climbing experience required, able to second or top-rope grade 3 ice. Leading on ice is both rewarding and serious. This course will give you the knowledge, experience and confidence to head out on the ‘sharp end’. Initial focus is ascent and descent of single pitch routes. Then we will get into the meat and potatoes of leading on ice. Climbing multipitch ice demands more advanced skills. Learn to become a competent member on a multipitch climbing team. No prior ice climbing or mixed climbing experience required. Can’t make this date? Put your own group of climbers together and you pick the dates. Want to try rock climbing with your winter hardwear? Looking for a taste of mixed climbing and picking up the basics? Try our Mixed Climbing Intro day.